What is community title in the ACT? What is the purpose of community title? Community title is a form of land tenure in the Australian Capital Territory, which brings separate parcels of land together in a ‘community’ of land that have a shared interest or use in common land eg roads or amenities. All of the owners of community title lots will have the use and benefit of the common property in the registered community title scheme. It sounds like unit title? A units plan has units that share common property (such as access ways, stair wells or lifts). However, a community title scheme differs from a units plan in that it has lots which share community title common property, such as a parcel of land that has a shared facility or amenity located upon it. A units plan may only be registered over one block, but a community title scheme may be registered over several blocks. Like a unit within a units plan, each community title lot has its own certificate of title within the community title scheme. And, like a units plan has an owners corporation to oversee the management of the units plan, a community title scheme has a body corporate to oversee and maintain the running of the community parcel or common facilities. Interestingly, a community title scheme can contain one or more unit plans that are registered over separate blocks in the scheme. What do developers need to do in order to register a community title scheme? for staged developments, details of the stages, and the sequence of those stages. Developers should also have regard for the requirements of the Land Titles Act 1925, and if applicable, the Land Titles (Unit Titles) Act 1970 and the Unit Titles (Management) Act 2011. What should buyers be aware of when buying into a community title scheme? Generally, community title schemes are utilised in larger development precincts to create a governance structure for the integration and cooperation of the owners of each of the parcels of land. If a units plan is also registered on a parcel within the scheme, there will be an added layer of governance for the land. 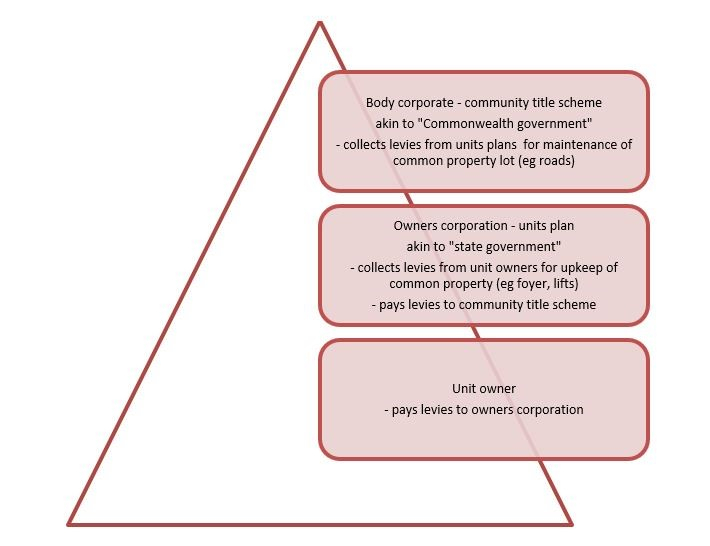 A useful way of thinking about a unit within a units plan that is part of a community title scheme is to think of the body corporate of the community title scheme like the Commonwealth government, and the owners corporation of the units plan as being akin to the state government. The diagram below depicts the relationship. A buyer of a lot in a community title scheme should receive proper advice in relation to all of the documents for the scheme, including the bylaws of the community title scheme and the rules of the units plan, and the interaction between the two levels of governance. What are the advantages of a community title scheme? One advantage of a community title scheme over a units plan is that the bylaws of the scheme can be uniquely tailored to the specific nature of the precinct. Unlike units plans which have default rules prescribed by legislation, the bylaws of a community title scheme can detail matters such as the use, operation and maintenance of the common property lot, and the way the lots will interact in respect to the shared common areas. What does the future hold for residential precincts in the ACT? As mentioned in previous e-briefs the ACT Government is undertaking reform of the unit titles legislation, particularly in respect of mixed use precincts. No new laws have been passed at the date of this e-brief. However, Meyer Vandenberg is across the practical implementation and legal drafting of ‘management statements’ as have been proposed under the reforms, and the differences associated with management statements as they relate to community title schemes. Meyer Vandenberg is able to assist developers, new lot buyers, unit owners, owners corporations and bodies corporate to interpret and understand the new legislation when passed.